I went to Mall 360 yesterday to watch the "transformers: revenge of the fallen" movie in the IMAX theatre and while I was there and Just before leaving the mall after watching the movie, I spotted Nespresso shop! It took me a second to think "shall I get the Le Cube coffee maker + the Aeroccino Milk Frother now or maybe later?!!" Finally I decided to enter the shop and get both! Later on I started to read the manual and check out the Grand Crus that comes inside the Nespresso box! There were 16 different Grand Crus with different taste and blends from different origins! After trying like 4 types during the day I was so in love with the "Ristretto" Grand Cru which was exactly how I like my Espresso to be, just strong in flavour and body. Ristretto combines the best South American Arabicas, from sources like Colombia and Brazil, with great East African Arabicas, finely sharp with a touch of robusta for added zing. The slow and split roasting of the beans creats a contrasting bouquet, bringing together subtle fruity and acid notes, with intensely roasted and chocolate ones. a nice gadget that makes delicious coffee, now aint that cool?! 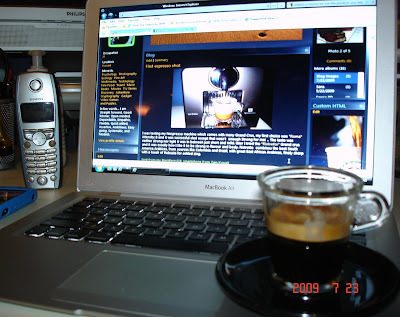 haven't tried Nespresso, but i love Tassimo's hot chocolate, reminds me of last year's Ramadan.. after fu6oor.. yum! Congrats on your Le Cube. I love Nespresso. There really is nothing better in my opinion. Don't forget to try the seasonals that Nespresso ships around the holidays. Because you are not a big fan of espresso Roma is the best choice for you since it is somehow light. 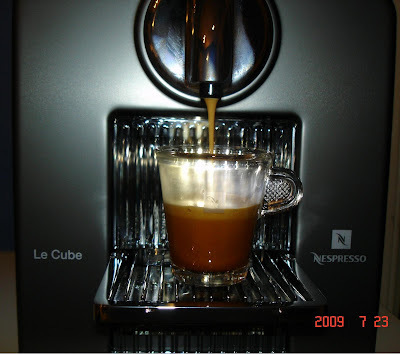 Ristretto is the richest espresso coffee and perfect for that kick start in the morning before starting work! Transformers is worth watching on IMAX, but I still think the 1st one was better. Mix: Yeah I got some extra crus from Ristretto, and I kinda use to have it everyday in the morning before leaving to work.